well… this is going a lot faster than i originally had thought. the game is currently what I will call “feature complete”. it’s all there. it’s just not done. basically all that’s left is bug fixes and polish, and that list is starting to shrink faster than it grows. i thought i would take some time and talk about level design. i’m not the world’s best at level design, and this is the sort of game that screams level design. in all honesty, voxterium’s level design was not very good, i will even go as far as to say the game was never really played by most, due to the level design. i received comments on that and really couldn’t argue. i made several blog posts about how the game didn’t want levels, and i forced them in. this game on the other hand is all about the level design. i mentioned in the earlier post that this was a game about assumptions. that still holds true, even more so than when i started. it’s extremely challenging to design levels around this concept… if you hand hold too much, the player is not challenged and the mechanics are a gimmick. if you make it too hard, the player is lost and gives up without even trying. the levels weren’t really too hard to design. while to solve them is sometimes difficult, the physical layout of each level is really simple. there’s a button, a door and a platform or two. it’s the ‘assumption’ that constantly changes, so the need for level’s complexity to grow to add difficulty isn’t necessary. 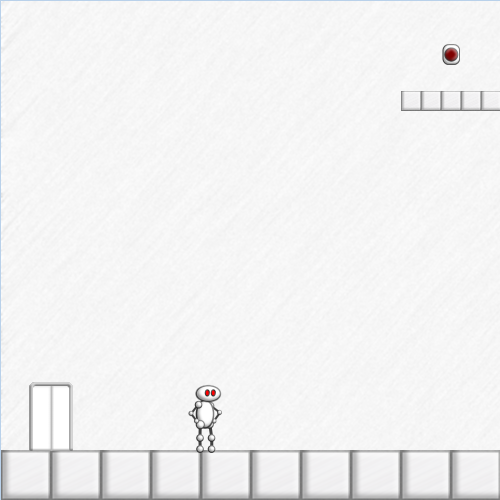 this is just a platform game -> ha ha… ok, thats clever -> can i really do what this level wants me to do? -> ok…. i get it now… all bets are off. i guess time will tell if i achieve that or not. Finally on the next project.